This orc is not alone in his belief that a change may be needed in order for the Horde to survive. However, the support backing Warchief Thrall is still outnumbering Garrosh supporters by a great deal, and also the onset of voter apathy has begun to set in. Wandering the streets of Orgrimmar you’ll find orcs that if asked their opinions on the election will simply stare at you for a second and ask, “Something need doing?” Perhaps if Garrosh can win the hearts of these apathetic peons he’ll stand a chance against the current poll leaders: Incumbent Thrall and Basic Campfire. Want to show your support for Garrosh or one of the other candidates? Get your Warchief Election Buttons Here! 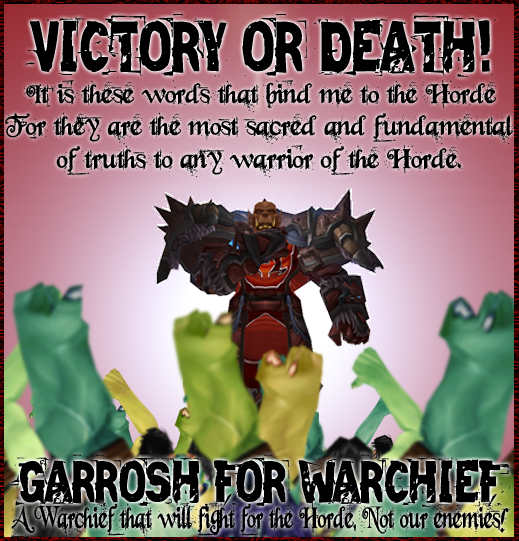 Posted on June 6, 2010, in Warchief Election 2010 and tagged garrosh, warchief election. Bookmark the permalink. 4 Comments. Hehe, nice first move from Garrosh. Although 32% of Orcs polled seem undecided, saying “Me Not That Kind of Orc”. .-= Wulfy´s last blog ..If I Were a WoW Boss =-. THRALL! THRALL! THRALL! He’s our man if he can’t do it Garrosh sure as hell can’t! .-= Tarinae´s last blog ..Tuesday with Tarinae 6/7 =-. BASIC CAMPFIRE! It’s hot! Hot! HOT! .-= Suzanna (aka Stardancerelf)´s last blog ..Hearthstone Tavern Podcast 16 =-.